I've spent most of my adult life battling the bulge. Haven't we all? But one think I've always been skeptical about is weight loss pills, drugs, fad diets and anything else that promises great weight loss without any work. To me, there's a corollary there between weight loss and financial gain: you can't get something for nothing. And, of course, if it's too good to be true, it probably is. For weight loss, you must obey this one simple principle: take less in (calories) and spend more (calories) to lose weight. For financial gain, take more in (money) and spend less (money) to gain money. It's that simple. Also, you really don't need to spend money to accomplish either goal. You can walk outside or run and use an online calorie tracker for your weight loss. For money, you can prepare a budget on a sheet of paper. It's all about your own discipline from there. Money can't buy you discipline. Calories have become a budget item for me. I use thedailyplate.com to track my calories. You plug in your weight, height, and how much you want to lose and how fast. It tells you how many calories you have to "spend" during the day. You gain calories back by exercising. If I have a big evening out planned, I make sure to eat a lighter lunch, cut back on snacks, exercise and order sensibly. I've also discovered what's calorie cheap: fruit and vegetables. You can eat an entire tomato for about 25 calories, an apple for 60, a banana for about 100. Full of fiber, fat-free and low in calories, this is a perfect way to eat lots of food and resolve my hunger. I've also discovered that some of my favorite treats have lost their appeal because I now know how many calories they cost me. A French Silk Pie Blizzard from Dairy Queen is almost 700 calories. Sure, I love them, but a half-day's worth of calories isn't worth it for me. The occassional donut, though, is about 260 calories, so I do still indulge in that. So far, I've lost 13 pounds, and I plan to lose more. I'd like to get down to the weight I was when I got married in 1996, which for me is the upper end of what the height/weight charts say I should be at - so it's reasonable and I know I'll feel great. It will probably also prolong my life. The financial cost to me is a membership in the local YMCA, which is for me, my husband and three kids, and a place we love to go, all for $60-some per month, and the $2.99 dailyplate.com application for my Blackberry. That's it. Years ago, I went to Weight Watchers, but I don't have the time to make a regular meeting, plus, I don't think the program teaches you the fundamentals you need. You don't learn about calories and nutrients, you learn about points, and ultimately, that doesn't do you any good. The point is this: you have to know what indulgences cost you before you dive in. If you have a tendency to spend on clothes that you don't need, stay the heck out of your favorite stores. Likewise, if you love ice cream but know that you don't have the calories available to eat that Blizzard, then DON'T GO to Dairy Queen. You can extend your life, and the life in your life, by engaging in good, old-fashioned discipline. It won't cost you a thing. Every week, Dan Danford provides advice to men going through the divorce process on Dad's Divorce.com. The advice, though, applies in most situations. You can watch his latest podcast below. This week's question from a viewer: My girlfriend will be living with me paying me a small part of the rent for my new home in cash each month. So will she be considered a co-borrower and thus have her credit score reviewed? We get questions from blog readers and followers on Twitter (@family_finances), and we're always happy to answer. Today's question is answered by Elaine Coder, Director of Client Services for the Family Investment Center. If you have a question for us, please post it in the comments section or e-mail robynsekula@sbcglobal.net. QUESTION: I have a Roth IRA, and I have a few questions. Does a Roth IRA have the same withdrawal restrictions as a traditional IRA? I’d like to know because I have a Roth IRA, but do not have a sizable emergency fund yet, and I’m wondering if I could take money out of a Roth IRA should some sort of emergency come up before retirement. 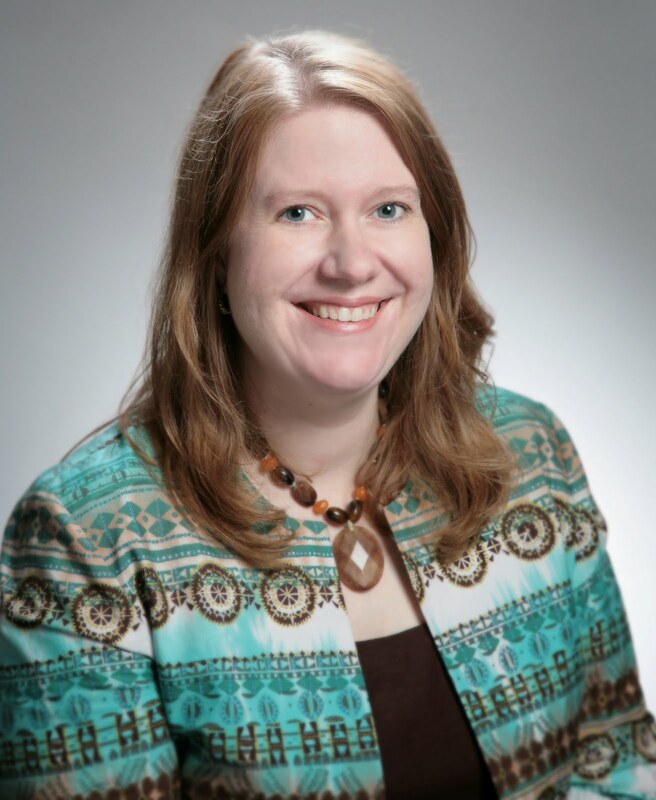 ANSWER FROM ELAINE CODER: An advantage of the Roth IRA over a traditional IRA is that there are fewer withdrawal restrictions and requirements. Because Roth IRA contributions are not tax-deferrable, withdrawals are generally tax-free, but not always. 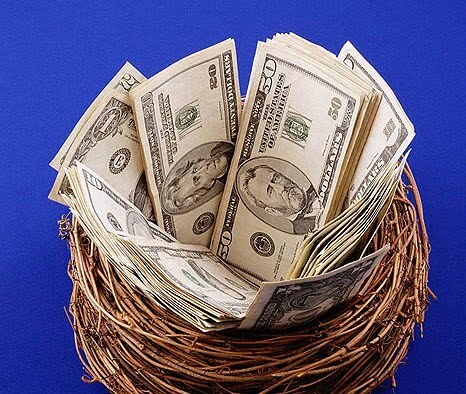 Direct contributions to a Roth IRA may be withdrawn tax free at any time. The earnings from your principle contributions can not be withdrawn until you reach the age of 59 1/2 without paying a 10% early withdrawal penalty. There is also a provision on being able to withdraw your earnings after 59 1/2 called the 5 year rule. You can only withdraw your earnings from your Roth IRA at 59 1/2 and have them count as qualified distributions if your Roth IRA has been open for for at least 5 years. Example, if you opened your account at 57, you would need to wait until you were 62 to withdraw any earnings on your principle. Money in a Roth IRA due to conversion from a traditional IRA may be withdrawn up to the total of the converted amount without penalty, as long as the 5 year rule has been met. The order of distributions is setup in order to help you avoid paying fees or penalties. Your contributions (tax and penalty free) come out first. Next come conversion or rollover amounts followed by earnings on your contributions, which could be assessed penalties if not a qualified distribution. * If you have un-reimbursed medical expenses that exceed 7.5% of your adjusted gross income. * You are paying medical insurance premiums after losing your job. It is best to have a sufficient emergency savings (6-12 months of annual expenses) trying to avoid tapping retirement funds. The point of a retirement account is to have the money going in, growing tax free using the power of compound interest, withdrawing the money defeats the whole process. What’s in a name, er, license plate? Roll back the clocks to 1985. Missouri opened the door to a new avenue of self-expression: the vanity license plate. At the time, I was driving a well-used Plymouth Horizon hatchback, with nearly as much rust as paint. It certainly wasn’t glamorous, but it was what I could afford as a junior trust officer at First National Bank. Banking, in those pre-TARP days, didn’t pay so much! I rushed down to the Department of Motor Vehicles and applied for personalized plates. I’m sure I requested “TRUST” and a couple of similar derivatives. 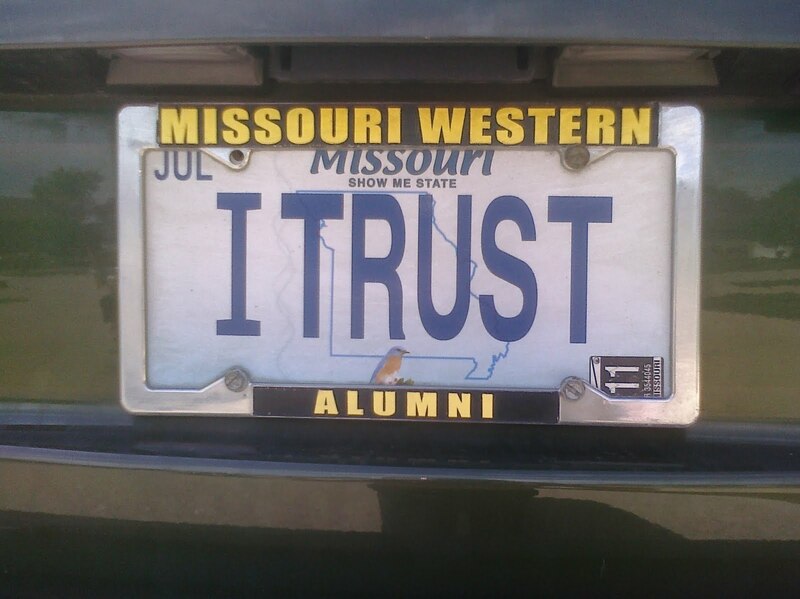 The plate I eventually got was “ITRUST.” I’ve owned it ever since. I stayed in the trust business until 1998 when I started Family Investment Center. I worked for three different trust organizations, and drove a dozen different cars. A few were “company cars” and the plates have been shifted back and forth among at least three different corporations. Today, they belong to Family Investment Center and are attached to my 2007 Jeep Cherokee. I’m not directly in the trust business today, but it’s related to what we do, and people have grown used to seeing my car and plates. The most common query I get involves religion. People ask if I’m a preacher. 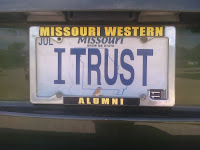 “No,” I answer, “but I do trust God.” There was a period where Missouri’s plates used the same font for both 1 and I. Then, people would ask what “1Trust” meant. Once, a national trust journal used a photo of my plate to illustrate an article about industry entrepreneurs. That was kind of fun, and I’ve still got a reprint of the article someplace. The funniest was with one of my earlier cars (maybe the aforementioned Dodge Horizon. A guy on the street asked why I’d publicly announce that IT RUST? A fair question, that. 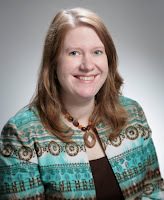 My wife is a school counselor (where she’s been recognized as one of the top in our state.) I devised the perfect plates for her, and she’s had them a similar period of time. ILISSN. If you ever see them parked together, you’ll know where to find the Danfords! President Barack Obama signed into law this week a large overhaul of the financial services industry. It would be easy for folks with ordinary portfolios to overlook this, but the Wall Street Journal advises that everyone needs to pay attention to this law, no matter how small their portfolio. For a good analysis, here's a link to the entire WSJ story. Editor's note: We recently fielded an inquiry from a member of the media who wanted to know how couples can pay for long-term care. Dan Danford had a terrific response that addresses this very common question, and I thought it would be helpful to share it with everyone here. Of course, if you have more questions, let us know in the comments section. We do quite a bit with retired clients, and this is a common query. My initial response is that the fear is greater than the threat. Most people worry about these costs, but that's because we focus on the horror stories we hear. In truth, the average stay in a nursing home is less than six months, and I've rarely encountered clients who exhausted all their resources. In fairness, though, our clients are more prosperous than most Americans, but experience tells me that they are the group that worries the most about it, too. Long Term Care insurance can be purchased with many options and most will cover some home care. But policies differ a lot from company to company and the terms are very important. There are elimination periods and daily rate caps, and even lifetime benefit caps. Some promise a return of premium, if unused, and others toss in some life insurance. This is a very complex product and I recommend great care in buying one. For comparison's sake, I suggest buyers visit the AARP website for explanations and price quotes. You might choose to buy through a local agent, but an quote through AARP is a nice baseline for comparing. Policies cost a lot more as you age, so many advisors recommend purchasing in the 50s. I am licensed in Missouri for health and life insurance although I've never sold a single policy! I keep my license current so I can evaluate existing policies for clients and the continuing education keeps me current on products and trends. But there's also a part of the survey that reports on the level of saving that people are doing. Apparently, 75 percent of those responding to the survey say their level of debt didn't increase during the first six months of 2010. In fact, 38 percent say that their debt actually decreased. This is great news - and exactly where we all need to be headed. Dad's Divorce: How long do I keep financial records? Dan Danford regularly provides commentary for Dad's Divorce, a web site for men going through the divorce process. Almost all of the advice he gives out on the site applies to both men and women, divorced, single or married. This week, he addresses a question from a reader about how long to keep financial records. Last year, my husband and I opened up Roth IRAs - one for each of us. It's a great way to save for retirement, as you don't pay taxes on the earnings when you take it out decades later once you're retired. Traditional IRAs tax the earnings, which can be substantial. I was glad to run across this post today by Peter Anderson which explains some of the Roth IRA rules for withdrawls. Since we don't have substantial emergency savings yet, I've wondered if could treat the Roth IRA as an emergency fund. And by that I mean only in the case of extreme emergencies, such as one of us becoming permanently disabled, losing a job, getting cancer, etc. Calculate your number: what do you need for retirement? By Jason T. White, ph.D. I was watching financial TV one evening and a popular commercial jogged my memory. The ad shows various folks like you and I walking around with our “numbers” tucked under one arm. These television commercials are patterned after a book called “The Number: What do you need for the rest of your life and what will it cost?,” by Lee Eisenberg, one of the top nonfiction books on The New York Times best seller from a 2006. It is a must read for anyone approaching or beyond their 50th birthday, and a strongly recommended read for those of us a few years younger. Eisenberg does a great job in mixing practical investment principles and theory in a comprehensive way, but without losing sight of the purpose of identifying one’s number. What is your number, you might ask? Well, according to Eisenberg, it is the dollar amount of your retirement nest egg which will allow to accomplish all of those yet unfulfilled hopes and dreams in life. To me, this is what made “The Number” so interesting. I have read dozens of how-to financial planning books related to asset accumulation, goal-setting, life expectancy, estate planning, and so forth. “The Number” is the first book I have run across that looks at the more spiritual or humanitarian side of wealth accumulation and planning, for lack of a better phrase. Eisenberg prods the reader to answer the question why we seem to be working our tails off trying to build the biggest number we possibly can. Is it the simple accumulation of money that is our primary goal and purpose in life, or is it what we can do with that accumulated sum that will make us happy? These are not easy questions to ponder nor readily answer. As a member of the business professoriate and a professional director of investments, I naturally am inclined to teach students in the classroom, and motivate clients in the business world, to save and invest as much as they can afford to do, with the idea of helping secure a comfortable retirement or other such long term financial goals. After reading “The Number,” I believe I need to broaden my focus a bit further. Everyone has his/her own picture about what the ideal retirement for them looks like. For some it is travel; others golf; and some simply want to be able to visit the grandkids a little more often. It is these sorts of thought-provoking questions that Eisenberg asks us to consider – and for most, the answers will not come effortlessly. We have all heard stories from time-to-time about the death of an elderly middle-class individual who we come to find out actually had socked away a seven or even eight-figure number – the classic millionaire next door. Invariably, the next generation inheriting this chunk of change will blow it on trips, cars, homes, etc. consuming away a lifetime’s worth of disciplined savings and investment of the decedent. “The Number” asks us to consider if that scenario reflects our personal financial wants and desires. Eisenberg suggests we work backwards when calculating our own number. In other words, begin by estimating the amount of annual income we will need in retirement, adjusted for inflation of course, and then compute the nest egg size (the number) required to provide that amount of income, using a conservative rule-of-thumb 4% savings withdrawal rate. Other sources of income besides just savings need also be factored in, like Social Security and pensions for example. In my next column, I will dig a little deeper into the nuts and bolts of how to calculate your own number, but until then, let’s spend some time focusing and contemplating on what we want to do with our number, not just how to maximize the size of it. Dad's Divorce: How do I estimate the cost of home insurance? Dan Danford regularly provides commentary for Dad's Divorce, answering questions from viewers about financial matters. In this week's edition of Money Made Easy, host Dan Danford answers this question from a viewer: I'm trying to figure how much buying a new home will cost me each month. What is a good way to estimate the cost of house insurance? Danford, MBA, CRSP of Family Investment Center, explains some basic techniques to quickly get a good estimate to use for planning purposes. There's something about our culture that makes us want to run out and get the newest toy with the biggest buzz. It is always worthwhile to do some checking, though, before you purchase something, even if every single person you know wants it, has to have it, etc. Today, Consumer Reports came out with some shocking news: the venerable publication is recommending against the iPhone4, due to reception problems. It might be a great toy - but it is NOT a good phone, according to CR. Folks, just remember. It's not a bargain if it doesn't work. At the Family Investment Center, we believe in supporting the community. 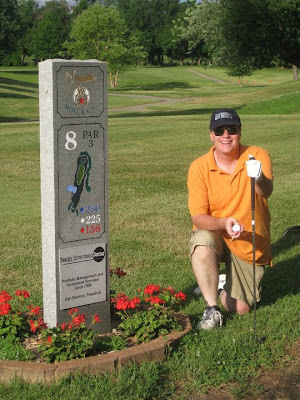 We recently decided to sponsor the eighth hole on the Moila Country Club. As part of the Shriners' organization, Moila raises money for children's hospitals. Golf is an economic development asset that helps bring businesses to our community. If you play a round, take note of who the folks are who sponsors holes at a charitable golf course. Those are the people who are contributing to your community.